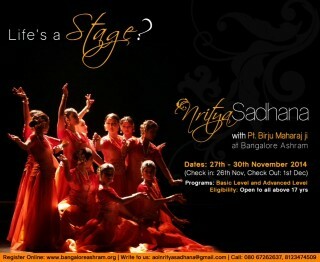 If you have the passion for dance, but never had the chance to learn.. here is a once in a life time opportunity for you! Embark on a 4 day journey with the living legend of the Indian Classical Dance form of Kathak, Pandit Birju Maharaj ji. Pandit Birju Maharaj is the leading exponent of the Classical Dance form of Kathak in India. Kathak is one of the eight forms of Indian classical dance, which traces its origins to the nomadic bards of ancient northern India, known as ‘Kathakars’ or storytellers. The name Kathak is derived from the Sanskrit word ‘katha’ meaning story. This is a unique opportunity to train under the Maestro. The Program integrates Pandit ji’s impeccable dance training with energizing Yoga, powerful breathing techniques, blissful Meditations, rejuvenating Ayurveda (an ancient healing science) and much more! The program will be conducted in the tranquil, beautiful and serene surroundings of the The Art of Living International Center. The campus is spread over 65 acres, with an abundance of flowering foliage spread along winding footpaths, a peaceful lake and the exquisitely beautiful architectural wonders.